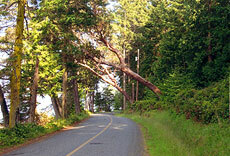 About Saturna Island ~ Lyall Harbour Bed & Breakfast, Saturna Island, British Columbia, Canada, A quality gulf island accommodation. 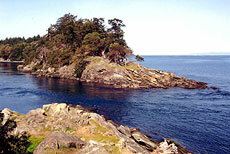 Saturna Island is the most southerly and easterly of the Southern Gulf Islands. With its moderate climate, friendly locals, and easy access from Victoria and Vancouver, Saturna is an ideal year-round getaway. 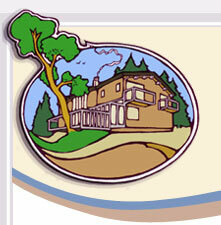 Come and enjoy the peace and tranquility of our beautiful Gulf Island retreat. A naturalist's paradise, the thirty-three square kilometer area includes forests, wetlands, mud flats, rock bluffs, reefs and beaches. Kayaking, cycling, and hiking are all popular pastimes with visitors, and there are miles of scenic coastlines and roads to explore. 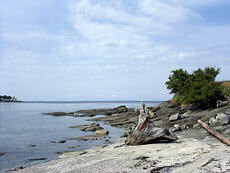 Saturna is also the least developed and most pristine of the Gulf Islands, with approximately half of the island protected under the Gulf Islands National Park Reserve (GINPR). Island facilities include; two general stores, post office, liquor store, fuel for cars and boats, artists' galleries and studios, a local pub and quality restaurants. All are in walking distance of Lyall Harbour Bed & Breakfast. The south-facing side of the island is home to the Saturna Island Family Estate Winery with its vineyards, bistro and wine shop.